Richard Dawkins is world famous evolutionary biologist and author. His book The Magic of Reality tries to explain in understandable ways some of the really complicated phenomenons of physics and science overall. In the midway of the book, I felt like back in school. 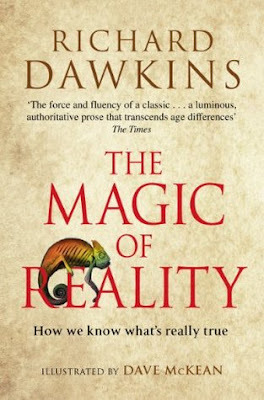 Quite many things very familiar, but the way Mr. Dawkins explains those helped to deepen the understanding quite a bit. The book goes through topics all the way from big bang to evolution to quantum mechanics. So it is really comprehensive overview to the universe as we know it. I give the credit to him on explaining things in very understandable ways. Mr Dawkins is a know atheist and science believer. It really shows in the book. He dismisses all religions. He does admit that there are many things science can't explain yet, but he sees it only as a shortage of current science, not as a possibility for higher forces. Atheism actually came disturbingly through from all the writing. That's a shame, in science facts should be facts without personal believes. I have to still recommend to people who want to understand physics and the world better. I felt like getting a fast recap of learning's from physics from many years at school. It's an excellent book, if you can tolerate the pushing of atheism.